Carrot and strawberries are loaded with Vitamin-A. this is responsible for aiding eye sight, immunity and so much more! 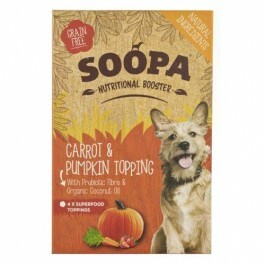 What is in Soopa Carrot & Pumpkin Nutritional Topping? Ingredients:Pumpkin, Carrot, Strawberry, Water, Organic Coconut Oil, Limestone (natural source of calcium), Psyllium Husk.